The Trinity Catholic High School varsity football team practices on Gaglio Field in Stamford, Conn. on Thursday, August 31, 2017. STAMFORD — When the Trinity Catholic football coach and athletic director resigned on back-to-back days in December, it threw up red flags. When the girls basketball coach left two weeks later, in the middle of the season, it left many around Stamford and the FCIAC speculating about what was happening at the school. Trinity is currently without a varsity football, baseball or boys lacrosse coach and have an interim athletic director. 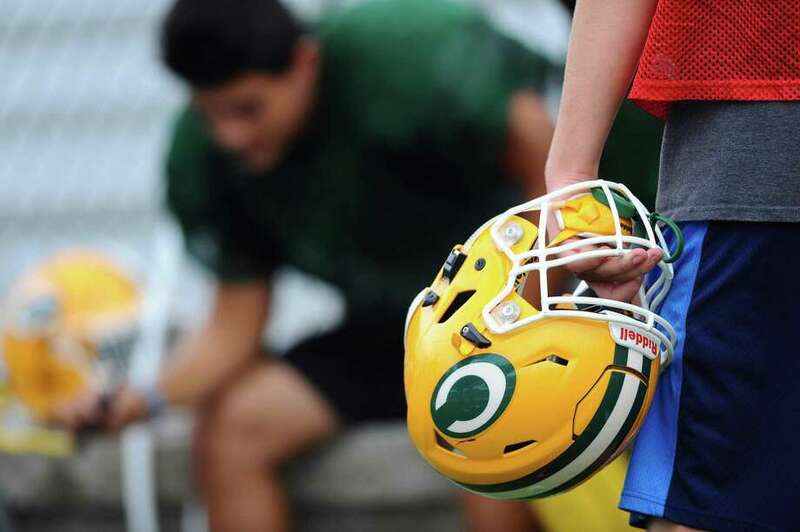 The school is facing declining enrollment which is directly affecting participation in sports across the board at the school. This is leaving the school with an athletic crisis not easily remedied if enrollment does not increase. With their current numbers, Trinity will be hard pressed to field varsity teams in several sports over the coming years, including football. Recently, control of decision making at the school shifted from the Diocese in Bridgeport to a nine-person board of directors which will provide oversight and make decisions on matters including finances, facilities, admission, tuition rates, marketing and other planning and strategic matters. Donny Panapada, a 1993 graduate of Trinity, decided to step down as football coach Dec. 17 after contemplating the decision for several weeks. Panapada felt he could not give the full effort needed to run the program, do his regular job and spend time at home and thought it was in the best interest of the school and his family if he gave up the helm. Panapada said it was an agonizing decision to leave a program and players so close to his heart. What Panapada was not anticipating was athletic director Bob Robustelli resigning as well the very next day, leaving the athletic department not only without a leader, but also creating uncertainty around the long-term outlook for the department and the school in general. Robustelli, a 1970 graduate of then-Stamford Catholic High School, was athletic director for about 2 1/2 years before turning in his resignation. Robustelli said he was leaving to pursue an opportunity through the company for which he is president, Robustelli Worldwide, LLC. Like Panapada, Robustelli sited the move being in the best interest of his family. Girls basketball coach Mike Martino surprised everyone by announcing his resignation a third of the way through the season. He too cited familial concerns, specifically being able to spend time with his new baby. Martino said his full-time job and long commute from Trinity to home was too much, and leaving the team during the holiday break was best for everyone. Long-time Trinity Catholic boys coach Mike Walsh, who retired as head coach earlier this year, took over the girls team and will coach them for the remainder of the season. Panapada said he did not know Robustelli was planning on leaving immediately after him and nobody had a clue Martino would leave after both. Panapada said he is not looking for other head coaching opportunities at this time and is hoping to lend a hand behind the scenes to whomever takes over the football program. What kind of football program the new coach will inherit is another question. Trinity struggled filling its varsity roster last season, playing multiple freshmen in every game and not fielding a freshmen or JV team. Last year the team had 41 players on the roster, including eight freshmen and 11 sophomores. Injuries whittled that 41 down towards the end of the season. “It has been very difficult the last two years. When we had good numbers, we had success here. It is hard to win when we have numbers in the low 40s and a lot of those were underclassmen not really ready to play varsity,” Panapada said. With seniors graduating, the current crop of football players at Trinity right now is hovering around 30 players. At that number, Trinity would be hard-pressed to field a varsity football team next fall and has school officials exploring alternatives, including starting a co-op football team with another school. Though the school would not confirm, the likely candidate to co-op with Trinity would be Wright Tech in Stamford. Currently, Wright Tech does not have a varsity football team, but has players in the school which could increase Trinity’s numbers. Trinity officials said nothing is in place, but discussions are under way. If Trinity does co-op with Wright Tech, its status in the FCIAC could be in question, though Macari said the school will do everything it can to stay in the league. FCIAC commissioner Dave Schulz said the FCIAC is in the process of discussing possible ramifications should Trinity go this route. Panapada confirmed discussions were under way about having a co-op team, but that had nothing to do with his departure. Interim athletic director Frank Fedak enters a school not only facing the possibility of having to co-op a football team presently without a coach, but also a school without a baseball or boys lacrosse coach for the spring. All of this on the heels of Trinity canceling its softball season last spring because of lack of players. The ice hockey program has struggled to survive in recent years, at times having as few as eight skaters for a game. The team is 4-13 this season with a 13-player roster. The school has announced it plans on fielding a varsity softball team this spring and is interviewing candidates for the other two spring jobs. Fedak said he knows the challenges facing him and the athletic department but he is hopeful he can begin moving Trinity in the right direction. First, by stabilizing the spring sports and then by finding the right person to lead the football program. The possibility of a co-op football team may save that program, but with only 40 total freshmen currently in the building and not many more expected to enroll by next fall, most sports at the school remain under direct threat simply because the numbers do not add up.